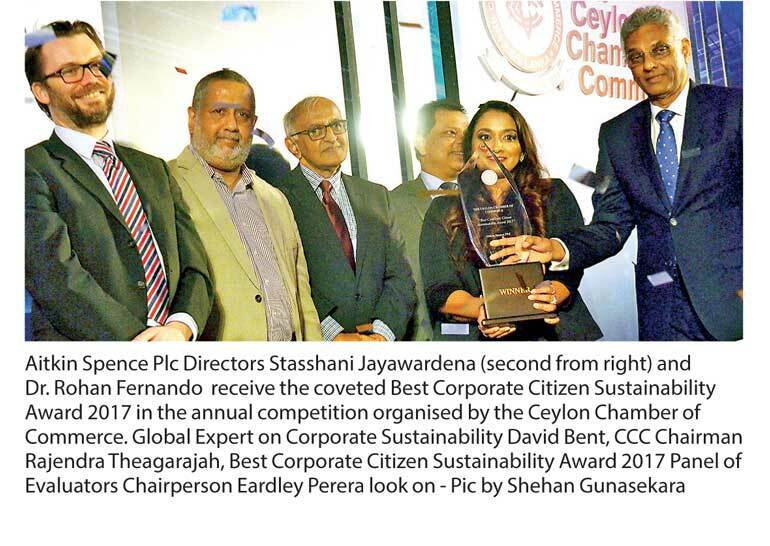 Aitken Spence PLC won the coveted ‘Best Corporate Citizen Sustainability Award 2017’ an annual event organised by the Ceylon Chamber of Commerce, the country’s premier business chamber to recognise sustainable champions of the local corporate world, while Hatton National Bank PLC and Cargills (Ceylon) PLC became the first and second runner up of the competition, respectively. The awards ceremony was held last night at the Cinnamon Grand Hotel, Colombo amidst a gathering of 350 top corporate executives. Japanese Ambassador in Sri Lanka Kenichi Suganuma attended as the Chief Guest of the event while David Bent, a global expert on Corporate Sustainability delivered the keynote address. Top Ten Corporate Citizens: Aitken Spence PLC, Hatton National Bank PLC, Cargills (Ceylon) PLC, Nestle Lanka PLC, Access Engineering PLC, Singer Sri Lanka PLC, People’s Leasing & Finance PLC, Ceylon Biscuits Ltd., National Development Bank PLC and MAGA Engineering Ltd. were recognised as the Top Ten Corporate Citizens of the year during the awards night. Category ‘B’ winners: In the meantime, Access Engineering PLC won the Less than Rs. 15 billion Annual Turnover ‘Best Corporate Citizen Sustainability Award 2017’ offered under ‘Category B’, while Citizens Development Business Finance PLC became the First Runner Up of the said category. Category Awards: Under Category Awards, Access Engineering PLC won a category award for Corporate Environmental Management, MAGA Engineering Ltd. was awarded for Environmental Integration, Hatton National Bank was recognised for Environment Beyond the Business, Aitken Spence PLC won two category awards for Employee Relations and Community Relations, respectively. Further, Nestle Lanka PLC was honoured for Customer Relations, Nations Trust Bank PLC for its work on Governance, Sirio Ltd. was awarded for Financial Performance and the Bank of Ceylon for its efforts in Economic Contribution. Triple Bottomline Awards: Aitken Spence PLC also won a Triple Bottom Line Award for its work on Environmental Sustainability, Nestle Lanka PLC was recognised for its contribution made towards Social Sustainability, while Bank of Ceylon was awarded for its actions on Economic Sustainability. Sector-Based Sustainability Champions: The Sector awards were won by Access Engineering for the Construction Sector, Hatton National Bank PLC for Finance Sector, Nestle Lanka PLC for Manufacturing sector, Aitken Spence PLC for Diversified Holdings while Sri Lanka Telecom PLC won a ‘Sector ‘award under the ‘Other’ category. Best Sustainability Project Awards 2015: Under the Best Sustainability Project Awards, Hatton National Bank PLC was awarded for its project on ‘HNB Powers up with Green’, Citizens Development Bank Business Finance PLC for the contribution it made via ‘Green Ninja – CDB Quiz Master 2017’, while Premium Exports Ceylon Ltd. was recognised for its ‘Arunella Waste Management’ Project. Merit Certificates: Cargills (Ceylon) PLC was given a Merit Certificate for its ‘Cargills Sarubima Project’, Access Engineering PLC was awarded a Certificate for its project on ‘Fabrication and Distribution of School Furniture’, while Citizens Development Bank Business Finance PLC won a Merit Certificate for its project on ‘Act Early for Autism Awareness Campaign’ and Bogawantalawe Tea Estate was recognised for ‘Fair, Green and All Inclusive’. Best Presented Application: The award for the Best Presented Application was won by Nestle Lanka PLC.